In a group setting like ours with a lot of cats using our cat trees, and some with unfortunate spraying habits, traditional carpeted trees with carpet or sisal posts just don’t hold up. They tear up quickly and also absorb odors and are impossible to clean. So I resorted to designing and building our own, and we’ve been very happy with them. 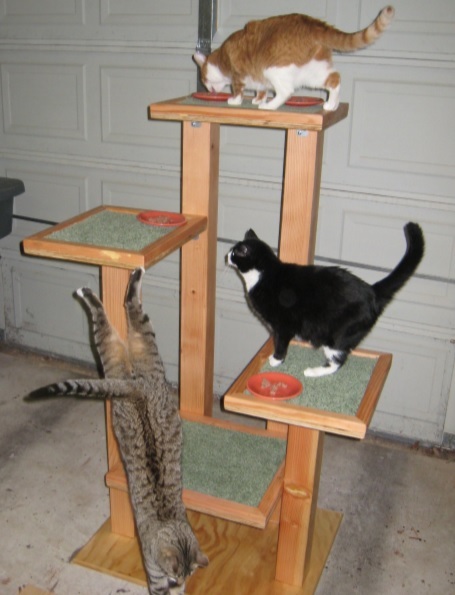 We’ve found that our cats are perfectly happy with the heavy carpet pads and wooden lip around the edges of the platforms – they don’t mind at all not having the soft carpeted edges and curves common on most commercial cat trees. The trees are made of wood that can be coated with urethane or a similar coating for a durable and cleanable finish. The platforms have inlaid pieces of heavy, thick, dense pile carpet. For the sanctuary we attached them with screws; for use by only a few kinder, gentler house cats you could probably just lay the carpet pads on the shelves. All of the components are put together with screws – this makes the trees very solid as well as easily disassembled if needed. 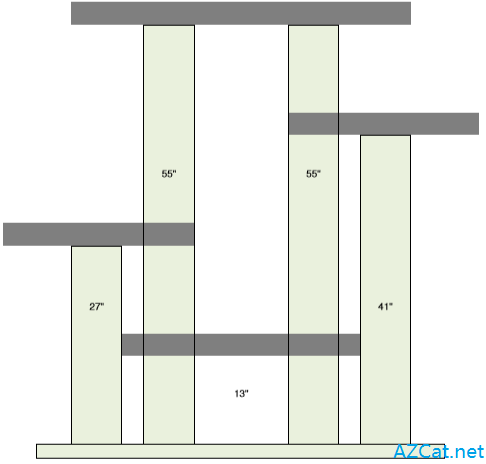 How to Build a Cat Tree ? You can use any type of smooth surfaced ¾” plywood you like. We used cabinet grade pine plywood to minimize the cost, but you could use birch or oak for a fancier look. Everything we build is designed to make the maximum use of standard size lumber with as little waste as possible. 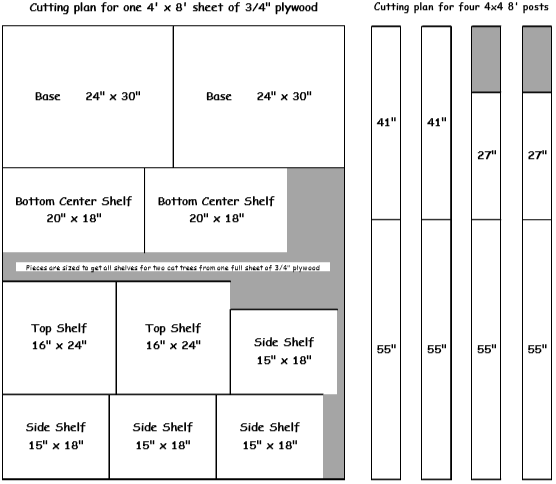 On the next page are dimensions and cutting plans for using one full sheet of plywood and four 8 foot 4×4 posts to get pieces for two cat trees. There are also several other lumber components, described below the cutting plans, that you’ll need for trim on the outside edges of the base and top edges of each platform. The platforms have a one inch thick raised lip like a picture frame that hides the edges of the carpet and makes it very easy to cut rectangular pieces of carpet to drop onto each platform. I used metal “L” brackets and screws for all attachment points to tie all the pieces together and make the platforms, especially the tall ones, very sturdy. The exact type of metal bracket isn’t important; whatever you can get at your local hardware store should work fine. There are pictures showing the brackets I used so you can get an idea of where I put them. 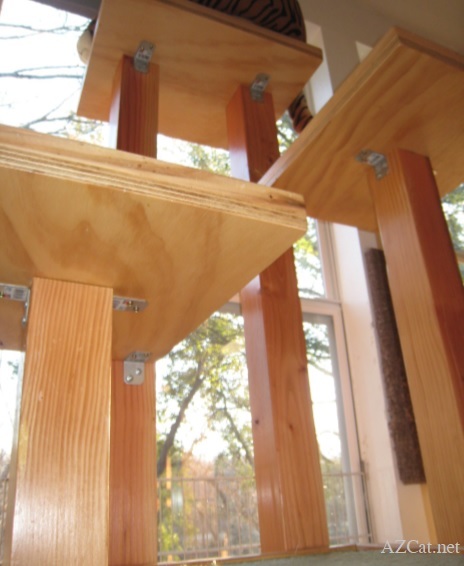 I used 16 metal angle brackets on each cat tree, two on the top of each post, four supporting the bottom center shelf, and two on the corner of each of the side shelves where they touch the back posts. Assembly instructions are further down – when you start putting the tree together it will seem shaky, but the angle brackets help tie all the parts together everywhere they touch and it will be very solid when you have it completely assembled. You’ll also need enough screen molding or other similar ¾” molding to cover the exposed outside edges of the plywood base. I did not add screen molding to the plywood shelf edges, and found that they looked fine with the 1×2 lip on the top side once everything is sanded flush. However you could easily add molding to cover the plywood shelf edges if you wish. You’ll need enough 1×2 lumber to put a raised lip around the top edge of all the shelves. You can either purchase 1×2 lumber, or do as I did and rip 1” thick strips off the two outside edges of 2×4’s. This is not only usually less expensive than buying 1×2’s, but the edges of 2×4’s are commonly rounded and make nice rounded edges on the lips without having to do excessive sanding. I found smooth fir 4×4 posts that looked very nice. You could also use rough cedar, which would make an appealing scratching post. At the sanctuary, with so many cats who spray, this just wasn’t practical but it might work well for home use. In assembling the tree, stand up the four posts with the middle shelf sitting on the floor for positioning. Attach brackets to the four posts to support the middle shelf 13” off the floor, then sit the shelf on it and attach with screws. Attach two brackets to the top of each post, and one by one attach the platforms to the top of each post. Use brackets to attach the edges of the two side platform to the tall posts they rest against. Once all the platforms are attached and you’re satisfied with the alignment of everything, use several long wood screws through the center of each platform straight down into the posts for added strength. Then lay the platform over on its front. It’s easy to line up the base on the bottom of the posts and attach it with long wood screws, several per post. Stand it back up and add the carpet pads. Detail of the underside of the platforms showing the metal angle brackets. Note the bracket securing the platform on the left to the tall post. The platform on the right has one also. It doesn’t show in this photo, but the bottom center platform attaches with angle brackets on the side of each of the four posts. It doesn’t matter which side has the shorter of the two side posts – that can vary depending on where you’ll put the platform in your home. We have four trees, two of each variation. These plans are vague in places – if you’re fairly handy you’ll breeze right through and no doubt add your own touches. But if you have questions about something I haven’t fully explained, please feel free to contact me. And we’d love to see pictures if you build some of your own!